Navarat Techadatanaprasert and Richard William Lord wear black high top Converse “Chuck Taylor” All Stars in the film. Pong, Kat, Woot, and Jib try to bring the heart needed for little Woon from a hospital taken over by terrorists. Power Kids is also titled Force of Five and literally translates as Five Heart Heroes. It’s a film about kids trained in martial arts, so you’ll think that you already know what you’re in for, but you’ll be quite surprised. Preteens Woot (Nantawooti Boonrapsap), “athletic cute” Kat (Sasisa Jindamanee), rascally Pong (Paytaai Wongkamlao) and sick little Woon (uncredited!) live at a Thai boxing school with their teacher Lek (Arunya Pawilai). Lek is also Woot and Woon’s father. Their friend, “library cute” Jib (Nawarat Techarathanaprasert) used to belong to the school, but has since retired. The four healthy kids are all trained in Muay Thai, the fighting style popularized in producer Prachya Pinkaew’s films The Protector and Ong-Bak The Thai Warrior, both starring Tony Jaa. He also produced Chocolate, Dynamite Warrior and Raging Phoenix. Woot, Kat and the others fight off a drunken man who attacked a student at their Muay Thai academy. A security agent tries to lead Pong and Jib away from the terrorists, while Woot and Kat lay in wait, thinking the man is a terrorist also. Our heroes work their way up to the disgruntled military general while trying to keep the retrieved organ safe. The ruthless general has no problem not only beating up these meddling kids, but aggressively trying to murder them! A fight ensues in a hallway. The kids bounce of the walls impressively, but that’s because the hall is so comically narrow it’s actually distracting. Mid-fight, the utterly unthinkable happens. The plot to this point has been a stretch, but what the evil general does with a single stomp is really just shockingly incredible, so much so that I don’t want to spoil it. Suffice to say, it sends the kids into a raged frenzy. Attacking as one, the four kids take down the general. After, his lieutenant, a fierce-looking but sympathetic female soldier, makes a redeeming sacrifice. Woon gets his heart. And Lek... disciplines the kids for doing something so absurdly dangerous. Even little Woon, who is now healthy enough to receive a punishment, gets a stern whipping for instigating this. (It’s actually endearing.) Power Kids is not, strictly speaking, a good film, but it is a surprising one. 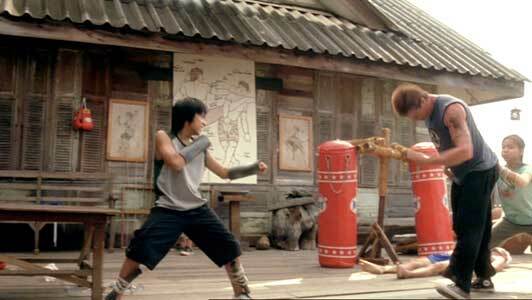 There are plenty of family films exploiting kids with martial arts talents. Those are usually exhibitions with thin plots about bullies and competitions. This is not one of those. This is a full-out action movie! Well, it has the veneer of an action movie, but it’s actually quite soft. The kids can’t be hurt, obviously, and the stiff henchmen have to visibly crouch to take the some of the blows. It’s also VERY manipulative. The sick boy (my wife disapproved of my calling him Thai-ny Tim) will rip out your heartstrings, but you’ll be fully aware that you are being suckered. Although told to stay away, Jib sneaks into the hospital to help the others retrieve Woon’s heart for transplant. The Thai trailer (with English subtitles) promises that these kids will become international legends for their awesome fighting talents. I doubt it. They didn’t do anything particularly impressive or innovative, have no personalities worth mentioning, and aren’t particularly great actors. Even while speaking a language that is foreign to me, they were wooden. The film coasts on the fact that these kids know Muay Thai. 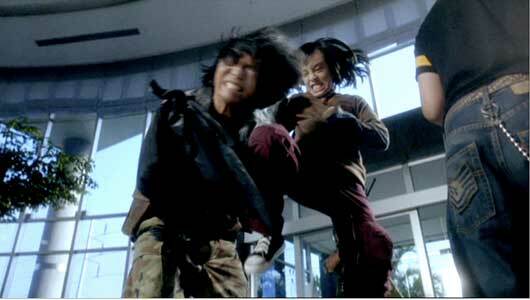 If you liked Ong-Bak and the new martial arts action films in general, this will be a pleasant, C-grade diversion. If your kids have any fortitude, it’s also an acceptable family film. Violent, yes, but there’s no potty words. But it’s not much more than a gimmicky commercial product. Jib takes on one of the terrorists. Jib puts her best foot forward. Jib wears black high-top chucks through the film’s third act in the hospital. She uses them to knee a bad guy (who is easily two feet taller her) right in the chin! Take that! Jib helps Pong get through the window. Later, she uses her mighty chucks when she and Pong are dangling precariously outside several floors up to kick her friend through the window. They both land inside safely. The drunken man starts to harass Pong. Power Kids. (2009) Nuntawut Boonrubsub, Sasisa Jindamanee, Navarat Techadatanaprasert, Phethai Wongkhamlao, Johnny Nguyen, Arun Shavilai, Darun Tantaiwichitwecch, Richard William Lord. Directed by Krissanapong Rachata. Categories: Action/Adventure. Power Kids would be a family movie, but it is rated R for extreme violence.